Stephen W. Terrell's (MUSIC) Web Log: CHOOO CHOOOO! I guess this means my long-threatened train song special on The Santa Fe Opry will be Friday Dec. 12. SANTA FE – Governor Bill Richardson today announced that after nearly a year-and-a-half of construction the New Mexico Rail Runner Express is ready to ride into Santa Fe. On Monday, December 15, 2008 the Governor will be joined by state, local and tribal officials, and several members of the public for the first inaugural train ride from Albuquerque into Santa Fe. Commuter service into Santa Fe is scheduled to officially begin on Wednesday, December 17, 2008. On opening day, the South Capitol Complex Station at the State Government Complex north of Alta Vista Street and the Santa Fe Depot at the Railyard north of Paseo de Peralta, will be open to the public. Two additional stations, one at Zia Road and St. Francis Drive, and a stop in southern Santa Fe at I-25 and N.M. 599 are scheduled to open in the future. The New Mexico Rail Runner Express will run on zone-based fares, with a roundtrip fare from downtown Albuquerque to downtown Santa Fe costing $8. Throughout the first three months of service Santa Fe County residents will be able to ride the train free of charge by providing proof of residency such as a driver’s license. Finalized train fares and schedules are available at www.nmrailrunner.com. 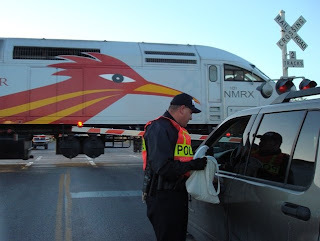 On July 14, 2006, the New Mexico Rail Runner Express began serving commuters between Albuquerque and Bernalillo. Today, the 50-mile corridor between Bernalillo and Belen averages 3,000 commuters daily and has seen more than 1.3 million riders in the last two years. The New Mexico Rail Runner Express is part of Governor Richardson’s Investment Partnership, a $1.6 billion transportation and infrastructure initiative that is improving highways in New Mexico, creating new modes of transportation like the commuter rail and creating high-wage jobs.